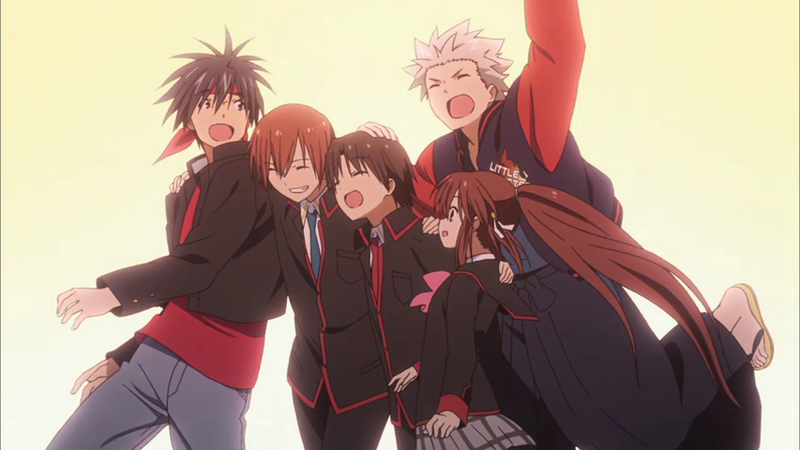 An Ode to Little Busters! This will be a short post. And also sappy. You have been warned. I could write walls of text about why I’m already loving Little Busters! ~Refrain~ so far, but I don’t think that will ever suffice. The more words you write, I find, the further you stray from the truth. Anyway, let’s see how this goes. my hand and yours, clutching together at an unseen hope. Posted on October 15, 2013, in Anime Analysis and tagged I am a sap, i have too many feelings, i write crappy poetry, little busters, refrain is so good it feels like a completely different show. Bookmark the permalink. 11 Comments. Doomed to die huh, I wonder if Little Busters will end on a sad note or not. I have not read the visual novel either, or well I haven’t finished it at least. They have really stepped things up this season. The directing was such a mess before and now it suddenly feels like they know what they are doing. I like the poem by the way. Nice poem. I was hoping that Riki would end up with Kurugaya, but oh well……they look so cute together. Wait, this brings me back to your post on shipping……never mind. But yeah, no words can be used to describe how nice Little Busters is at the moment. Never considered Riki and Kurugaya as a couple at all until this season came along, but I think the anime portrayed their relationship note perfectly. How do I say it….? It feels like a very empathetic portrayal of first love, as sad as it is fulfilling. Hey, I’m really glad it’s finally working out for you anime-only watchers. Since I finished the visual novel just before the first season started, I felt that the the general pacing and direction couldn’t capture the same feeling as the VN across the board, in the gags, in the characters, in the atmosphere of friendship, and in the drama. But with the focus tightening up towards the “true/main route” this season, I’ll definitely be tuning in again to see how it turns out, and your positive responses this early on are a good sign! There are definitely still issues that make me favor the VN over the anime, but if it does its job with the coming story, I’ll be satisfied. Ah yes, and pretty great poem. Somebody should put it to a tune, add some wistful acoustic guitar accompaniment, and replace the new ED theme with it. That ED is just not cutting it for me. But the new OP is great! I thought the first season was pretty mediocre across the board, so the direction of Refrain has really surprised me. But I guess I’ve always been something of an anime apologist. The drama was horrid, but in the lighter moments, I could feel the weight of their friendship just the same. For all its technical and storytelling faults, the show has heart. Nice poem :-). Can you watch it without the first series? Thanks! You can’t watch Refrain without seeing the first season, unfortunately, and unless you’re a masochist or you just have a lot of patience, I can’t recommend the first series on good conscience. I suggest downloading the game if you want the full experience. Maybe I’ll wait for final impressions to decide whether to watch it then. I got through Clannad so I could watch After Story, so maybe I could do the same with LB.